We carry 4 main groups of construction products. Electric Power Tools & Equipment For example, we have electric drills, water pumps, jigsaws, hammers, grass cutting machines and more. We offer One Stop buying and we deliver directly to the customers. We have been established and serving our customers on Phuket for 70 years. We provide the best service & equipment. We have off a large, comfortable off street car parking area. 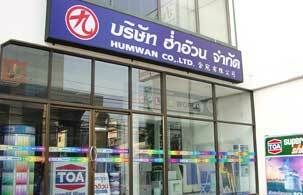 Hum Wan extends between two streets and we have easy entrances from either side.